Fabulous Felines by Laurel Burch Calendar Wall Hanging Kit. 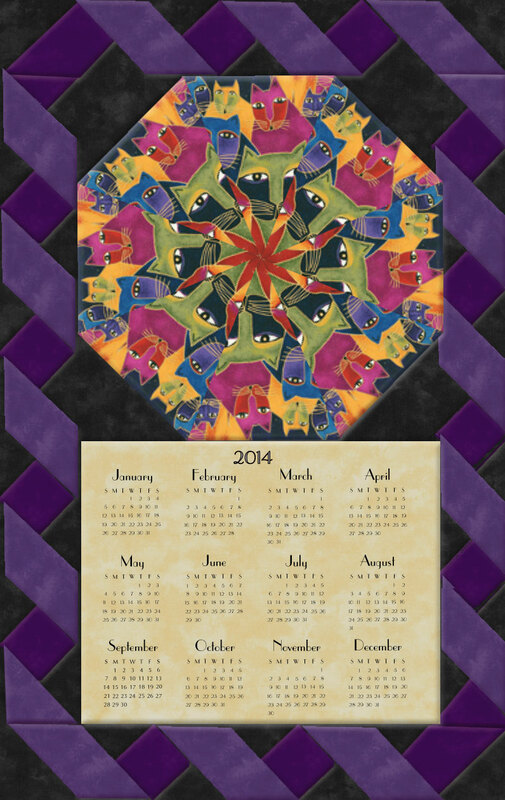 The focal Kaleidoscope is cut from Laurel Burch's Fabulous Felines. Whimsical, vivid and witty. The details of the Cats are exquisitely rendered with metallic gold to highlight them. The colors are a palette of Jewell Tones, Magenta, Royal Blue, Green, and Purple on a Black ground, all etched in gold metallic.This includes the illustrated instructions to make this Wall Hanging as well as a preprinted 8 1/2 by 6 3/4 inch muslin insert with the calendar printed on it. The finished size of the Wall Hanging is approximately 11 by 17 1/2 inches. Block and 3 fat quarters included.